You can tell about the homeowners by taking a good look at their homes. Just like the external body language of a person, the home reveals the entire story without actually speaking. At MK Home Design, our efforts are towards creating homes which are the truest expressions of the homeowners. It does not matter whether you have renovation on mind or an altogether new home design, a home designer must lay stress on fusing form with function. Only a true blend of functionality and aesthetics can help create a great home. You don’t want your home to be beautifully embellished but short on natural sunlight and ventilation. Similarly, only catering to the utilitarian elements may not suffice. A home must look good to the human eye, too. While designing home, we have to look at the biggest picture. The ideas/principles of designing or renovation are different for unique needs of each house and you cannot establish them unless you have answered a few key questions. What are the plans of the homeowners in the short, the medium and the long run? What is their budget (are they flexible with it)? Can they extend the budget if the designer wishes to add something really meaningful or ROI-centric? What is the exact need of the family? Who are the residents (aged parents, toddlers, adult children, single-family household, inter-generational household)? A home has many needs which are clear to any bystander. However, there are many subtle needs, too, which only a home designer at the top of his/her game can understand. For instance, the slope of the land or the orientation of the northern flank or the floor plan may put forth many designing constraints. Unless the designer knows how to tide over such barriers, he won’t be able to get you a home which best serves its purpose. What is true for new home design is just as true for home renovation. In the years that MK Home Design has closely monitored and travelled in sync with the renovation industry, one thing has become amply clear. Best renovations are those which are carried over a big canvas- in an expansive way. Yes, you can definitely ask us to redo your kitchen space or renovate your bathroom but think- how is a partial facelift going to offer uniformity or a sense of homogeneity to your home? You don’t want a thriving kitchen standing adjacent to a crying-for-reno bathroom, do you? In course of our growth, we have witnessed time and again that the happiest clients are those who undertook full-fledged renovations for their houses. Yes, it takes money but 1) it can bring in a lot more money during resale and 2) you do not have to renovate your home each year so you can save towards the effort and thankfully, brilliant loan options are available, too. 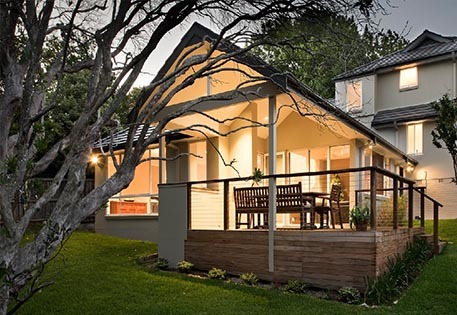 While conducting any home renovation in Wahroonga, we seek really cost-effective solutions for you, even while keeping the scope of the job really big. The renovation industry can give mixed signals on the whole but believe us, there is enough in its tank. We can look at good days ahead for it and it is an especially good time to get your home redone (not to mention that you can be equally bullish about new home design). Martin Kolarik (the captain of the MK Home team) has in-depth knowledge of Bushfire safety and local council regulations. Homeowners in Campbell Drive, Grosvenor Road, Cliff Oval and many other areas would vouch for the need of those home designs which cater to Bushfire specifications. Martin has a phenomenal strike rate with council approvals because he blends clients’ unique needs with the requirements of the council. While artists can afford to get carried away by their whims, the designers- even though they are artists, too- have to remember their social responsibility. They are assigned the job of building homes (the cornerstones of societies) and so they have to tie their aesthetic fancy with function. Martin feels that there is a recipe to building those homes which a homeowner can take pride in living. It is a simple recipe. The home designers have to listen intently and speak less while having their first conversations with the homeowners. As a designer, you want to absorb as much as you can before letting your imagination and designing concepts take over. This is how a true marriage of homeowner’s vision and designer’s working principles can be attained. So feel free to give us a call and let us journey with you on your dream home design or home renovation project in Wahroonga.